We all love peanut butter and chocolate around here, but I have one child who is a really big fan. So I guess you could say these Loaded Peanut Butter Chocolate Oatmeal Cookie Bars are in his honor. 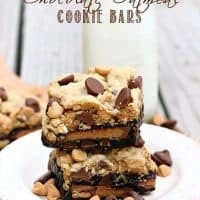 But there’s definitely something for everyone here…..a chocolate brownie layer, an oatmeal chocolate chip cookie layer, and in the middle of it all, whole peanut butter cups! These were seriously amazing! I was a little worried there might be too much going on, but all of the flavors and layers came together perfectly. To say we loved them would be an understatement. They also got rave reviews from the few friends who were lucky enough to get a sample. Because really, it was just so hard to share. Preheat oven to 350 degrees. Line a 9-inch square pan with parchment paper. Make the brownie layer by combining flour, cocoa, and salt in a large bowl. Melt butter in a large saucepan and remove from heat. Stir in sugar and vanilla. Quickly whisk in eggs, one at a time. Add butter mixture to flour mixture and stir until well blended. Spread 1/2 of the brownie batter in an even layer in the prepared pan. Press the peanut butter cups into the batter. Spread the remaining batter over the peanut butter cups (don't worry if it isn't perfect). Bake for 20-25 minutes or until the brownies are set but not quite done. Meanwhile, make the oatmeal cookie layer. With an electric mixer, cream together the butter and brown sugar until fluffy. Mix in the egg and vanilla. In a medium bowl, whisk together the flour, baking soda and salt. Add the flour mixture to the butter and sugar mixture and blend well. 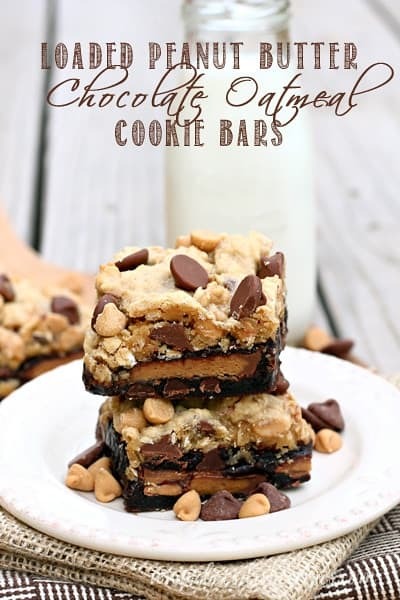 Stir in the oats and 1/4 cup each of the chocolate and peanut butter chips. Dollop teaspoons of the oatmeal cookie mixture over the baked brownies. Sprinkle with the remaining chocolate and peanut butter chips. Return to the oven and bake for an additional 10-12 minutes or until the cookie layers is golden brown. Cool completely before cutting into bars. These look great! I love all the peanut butter cups and all the layers. I’m pinning this!